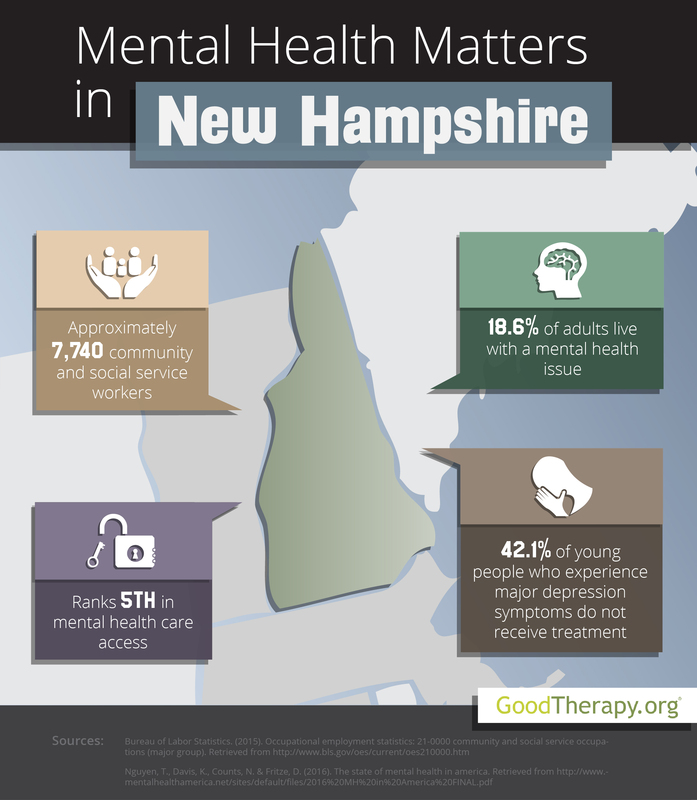 Find a therapist in New Hampshire with GoodTherapy.org. According to information published by the U.S. Census Bureau, the state of New Hampshire was home to 1.3 million people in 2015. Approximately 93.9% of the residents are white, 1.5% are black, and 2.6% are Asian. Females made up 50.6% of New Hampshire residents. Data from the Bureau of Labor Statistics (BLS) suggests 7,740 people worked in occupations involving social service or community assistance. Typical jobs within this field may include working as a counselor at a residential treatment center, parole officer, community health worker, child psychologist, clinical social worker, psychiatrist, religious worker, clergy member, health educator, counselor at a drug and alcohol rehab center, or a marriage and family therapist. In New Hampshire, people working in these career fields earned $45,670 on average annually. After being evaluated by Mental Health America (MHA) and compared with the remaining 49 states and the District of Columbia, New Hampshire was given an overall rank of 11th for statewide mental health conditions and standards. In addition to the overall rank, New Hampshire was 15th in adult ranking, 34th in prevalence of adverse mental health conditions, and 5th in access to mental and behavioral health care services. These placements are generally indicative of a high rate of access to care among all age groups. According to MHA researchers and therapists in New Hampshire, the state’s high access to care ranking correlates with several local social factors, such as low rates of toxic chemical release, violent crime, poverty, and unemployment, as well as high rates of graduation from high school. The 2016 MHA survey states roughly 18.6% of the adult population has mental health issues. This percentage equates to about 193,000 residents. The survey also indicates both the adult population and the youth population in New Hampshire display a high dependence on chemical substances, compared with other states. New Hampshire was ranked 40th for adult dependence on drugs or alcohol—with 9.6% of adults affected—and 49th for youth substance dependence—with 6.8% of young people affected. A 2014 report from the Substance Abuse and Mental Health Services Administration (SAMHSA) claims in 2012-2013, binge alcohol consumption among people ages 12-20 and illicit drug use among teenagers in New Hampshire were higher than the national percentage. Despite these statistics, research from MHA and SAMHSA shows mental health options are available for people who need professional care. Mental Health America reports that in 2016, New Hampshire had the ninth-lowest percentage of adults with mental health issues who did not receive treatment; the lowest percentage of adolescents with depression symptoms who did not receive treatment; and the sixth-highest percentage of young people with severe symptoms of depression who obtained consistent depression treatment. In New Hampshire, 15.5% of adults with mental health concerns are uninsured and 6.5% of children are insured with a provider that does not cover mental and emotional issues.